Thank you for visiting mobilitydepot.co.uk. If you require assistance, seek advice or simply wish to place and order with us, this can be done in a variety of ways. During business hours, there is always a helpful voice at the end of a telephone who will gladly assist with your enquiry. If you have a question about a product, seek advice or simply prefer to deal with a person rather than a shopping cart program, then call us directly. We have a friendly member of staff who'll be pleased to chat with you. You may like to use our Online Order Form. Simply select the product/s you require, enter the details into the online form along with your contact info and send. You will notice we do not ask you to enter payment information at this point. (This is a security feature. See below for further details) When your order is received we immediately check stock. A member of staff will then contact you promptly to confirm your requirement, run through its suitability for your needs (should you wish) and availability. Providing everything conforms with your wishes payment can then be made in the manner you choose. Orders can be placed by Fax. 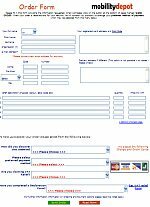 Simply fill out our Faxed Order Form and send it to us. As with an online order, you will receive a confirmation phone call to check the details of your order. Orders and payments can be made by post should you prefer. Whilst you are most welcome to use this method please be aware that the simple mechanics of this choice often prolongs the lead time by a few days. Payments may also be made by Credit/Charge card or by Bank Transfer. The choice is entirely yours. Once your order has been fully processed it's a simple matter of awaiting delivery. You are welcome at any time to check the progress of your order. As a rule, an estimated target date (and where possible - a time) will be provided when your order is processed. Sometimes this estimate will need to be revised. If so, you will receive a call explaining the revision. All business transacted shall be in accordance with our standard terms and conditions. You will notice, WE DO NOT ASK YOU TO SEND CREDIT CARD DETAILS OVER THE INTERNET. There are good reasons for this. Firstly, we believe it is possible to utilise modern technology such as the internet without giving up good old fashioned customer service. We offer such a service so you can talk to somebody during the process of finalising your order. This way you can ask any questions you might still have and confirm items are suitable for your purpose before paying for them. Secondly, your security is of paramount importance. Sending your card details over the internet places you at risk from fraudsters. Anything transmitted or stored electronically can be intercepted no matter how secure a system claims to be. We address these issues by speaking with everybody who places an order hence removing the anonymity of the 'shopping cart system' and the need for electronic transmission of your card number. Your personal information is not stored on a computer which is connected to the internet and cannot therefore be hacked. For this reason we enjoy a premium security rating. Furthermore, your information will never be passed on to another party (unless we are required to do so by Law) or used for any purpose other than processing your order. Or, why not give us a call, we are always delighted to hear from you.